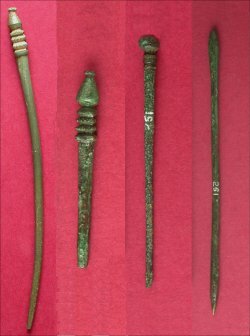 There are 127 pins in our archaeological collection, and these date from the Roman to the Post Medieval period. We know that pins were used as far back as the Neolithic period (about 7,000 years ago) due to archaeological evidence from burials, where the pins have survived on the head or body. We also have evidence from the Roman and Medieval periods in the form of drawings and sculptures. Selection of Pins from the collections.